This is the first major new English translation of Chekhovâ€™s perennial classic in over thirty years and was brought to life with a vibrant cast. With the backdrop of the rich living a life of extravagance, decadence and dissolution on the backs of the poor, some would draw parallels to growing disparities in the distribution of wealth today, although in Chekhovâ€™s day, this led to revolution, coming only a year after The Cherry Orchard was first performed. The Cherry Orchard gives a flavour of the disparities in Russian life which ultimately led to the 1917 revolution. The Cherry Orchard offers many different viewpoints, from the servant who in 1904, forty years after the emancipation of the serfs, still seems to believe in serfdom to another servant who makes good, ultimately buying the orchard. There are of course the frivolous, feckless aristocrats, pining over the Cherry Orchard, which they never seem to actually visit; symbolising their life of privilege. Then there is the failing university student, one intelligent character who probably voices some of Chekhov's own opinions. This is a play as much about people as politics; notably the hypocrisy of the matriarch, who abandons ship and runs of to Paris to leave the running of the impoverished estate to her daughters, and the mother lamenting the death of her seven year old son, although she was absent from when he died. Almost everyone seems to be a failure; all the aristocrats owe money, the love interests fail, the student in University is failing and denial of reality is a constant protective mechanism. Why all this failure? It takes a good look at society in the whole in order to assess what is going on. The rich who are untrained for anything except being snobs. Not surprising then that they lose their wealth. The poor who seem to only be trained to be servants, not surprising that society seems to be falling apart. There is a fleeting mention of a middle class job, station master, but overall, work is looked down on and despised, hardly the cornerstone of an economically progressive society. A rigid believe in your position based on the accident of your birth will leave the majority of the population unsatisfied, unhappy and angry which comes across in the play. There are several nice touches with the Royal Exchange Production, such as the ghosts of the old man and child. The costuming was all well in keeping with the period and the large cast all brim with enthusiasm for their respective parts. Kirsty Bushell shines as Lyubove Ranyevskaya, the main protagonist and Jude Owusu gives a strong performance as Yermolai Alekseyevich. Special mention must also be made of Togo Igawa who gave a delightful portrayal of Firs, the old servant. The set however, or absence of it, is remarkably sparse; with for the most part, just one item of furniture and the floor, which is frequently an integral part of a Royal Exchange set, is left as just basic plain wood (the fact it resolved for one short period seeming to serve little purpose). It also was difficult to hear all the lines because being in the round, actors are frequently facing away from parts of audience when speaking. Lighting and other effects were also used very sparingly and with the large cast frequently moving about on stage, is not easy to get a full appreciation of the different settings. 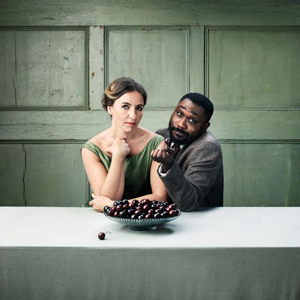 The Cherry Orchard is on until the 19th May.